I am an extreme vegetable lover. Truly, I don’t think there’s a single vegetable that I won’t eat. My friends know this, so when they wind up with a vegetable that they don’t like or don’t know what to do with, it frequently winds up on my doorstep. Recently, one of my friends got a big ol’ fennel bulb in her CSA delivery, + not being a fennel lover, asked if I wanted it. Uh, YES! I went to twitter for ideas on what to do with it (raw in a salad? shaved on a sandwich? baked into a casserole?) 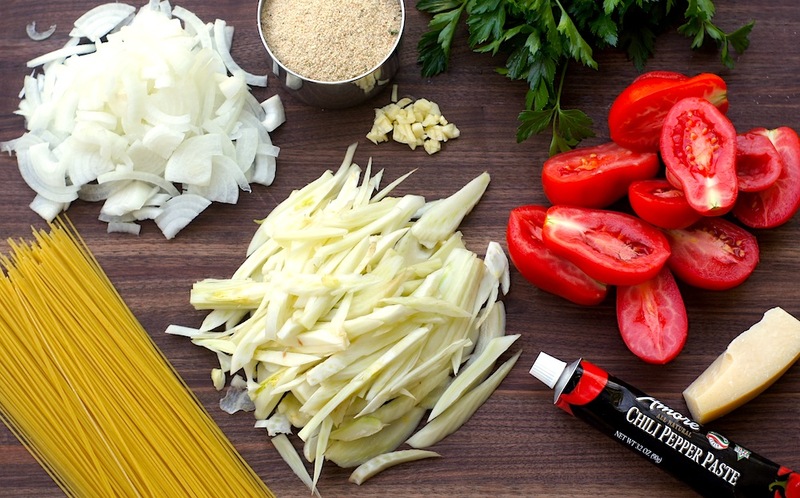 + my friend Amanda said that she loves fennel paired with tomatoes + pasta. Pasta is one of my favorite foods, + we grow tons of tomatoes in our garden, so I was sold on her idea. I found a fabulous-looking recipe for Spaghetti with Oven-Roasted Tomatoes and Caramelized Fennel, + got cookin’. And y’all, this turned out wonderfully delicious, with an amazing combination of flavors + textures. The onions, garlic, and fennel – which can all be quite potent if served raw – mellow and sweeten up beautifully in the cooking process. Added to some pasta, the delightfully flavorful oven-roasted tomatoes, some spicy chiles, + topped with tasty parmesan + toasted breadcrumbs for texture, this dish is one of the most delicious vegetarian pasta dishes that I’ve had. Even my husband, who’s not a huge fan of meatless dishes or fennel, said that he loved it. I will absolutely be adding this to the regular dinner rotation, especially this time of year when tomatoes + fennel are in season locally! *The chiles, chili pepper paste, or crushed red pepper will make this dish medium-spicy. If you want a milder dish, use half of the chiles/chili pepper paste/red pepper. Or, omit altogether if you want a completely spicy-free dish. 1. Heat oven to 250˚. Core and halve tomatoes lengthwise; scoop out seeds. In a bowl, combine tomatoes, 1 Tbsp. oil, sugar, salt, and pepper; toss. Arrange tomatoes, cut side down, on a parchment paper–lined baking sheet; roast until very soft, about 3 hours. 2. Heat 2 Tbsp. olive oil in a 12″ skillet over medium-high heat. Add fennel; brown for 10 minutes. Add onion; cook until soft, about 8 minutes. Add garlic + chiles (OR chili pepper paste OR crushed red pepper); cook for 2 minutes. Chop and add roasted tomatoes to the skillet, cook for 1 minute more; set skillet aside. 3. Bring a pot of salted water to a boil. Cook pasta until al dente, about 8 minutes. Strain, reserving 1/2 cup pasta water. Add pasta and its water to tomato mixture; toss. Put skillet over high heat; add parsley, lemon juice, and remaining 1 Tbsp. oil; cook for 2–3 minutes. Season with salt and pepper. Sprinkle with grated Parmesan and breadcrumbs, and serve. I have a single recipe that I use fennel in, and I never know what else to do with it. Sounds like you’ve found a winner! This one is *definitely* a winner! Like I said earlier, this dish looks so beautiful and delicious that I would <> chow down on it. Before I remembered the FENNEL. 😉 I’m glad I could donate it to a tasty + good cause and that it was enjoyed by Mrs. AND Mr. Fearless both. Wow, Amy! This looks beautiful! I might just have to order some chili pepper paste while I’m waiting for my fennel to fill out! This was my first time using chili pepper paste and I *loved* it! You’ll have to get your hands on some! I love fennel but I have never added it to pasta – I bet its a great addition. Im all over that chili pepper paste too – adding it to my shopping list. You are making me seriously crave some fennel! It’s so good, but I always forget about it. I need a big bowl of this awesome pasta for dinner! Oh my goodness, this looks mouthwatering Amy! I am a veggie lover too and love how jam packed this pasta is. The fennel sounds amazing in here with all the flavors – I’m totally craving for some of this right now – yum! I crave pasta constantly and I am always looking for more dishes that include fennel. YUM! Thanks for sharing. What a tempting dish, a classic for summer. I adore oven roasted tomatoes – the dry heat just brings out the best – and caramelized fennel – well, it just rocks my world. Italian cuisine often makes use toasted bread crumbs. Don’t they add wonderful texture? It’s just another aspect of “cucina povera”, the cuisine of the poor, a cooking style that lets nothing go to waste. It’s a pleasure to visit your site again. A car accident, surgery and then a move and loss of internet service have all come together to keep me out of touch with everyone for quite some time. We recently moved out of our home and into a rental while we completely remodel our house. The folks at AT&T said we’d have our internet back in 2 days, but it stretched to much longer than that, close to a month, inf act. I sure missed a lot, but I am glad to be back in time to see this very lovely and tempting dish. Complimenti a te, as we say in Italian. Brava! Oh, Adri, I’ve missed you! So sorry to hear about the car accident and surgery – hopefully you’re on the mend? And I can’t wait to see new recipes up on your blog in the upcoming months – you always have the best recipes. =) Cheers, my friend! Man, I wish I loved as many veggies as you! I didn’t think I like fennel until my sister-in-law made a pasta with it in it, which probably means I will like this one too. Your tomatoes from your garden look amazing! So, no taste of licorice? That would be my concern. Looks fab, though! I’ve been looking for more ways to use fennel! 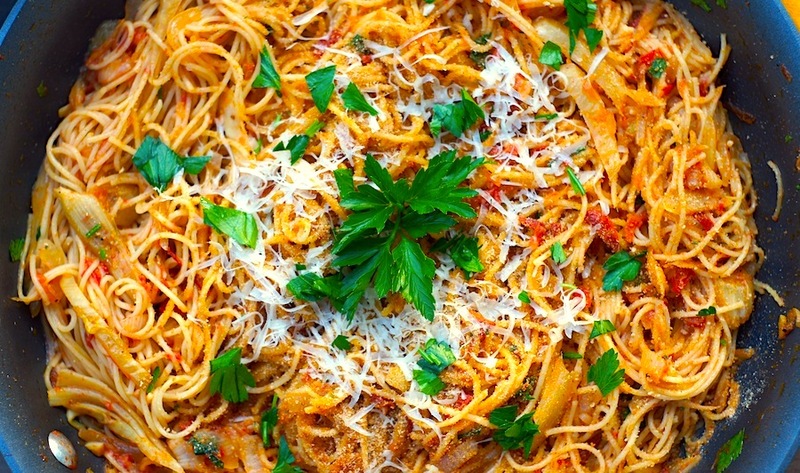 This pasta looks great! wow amy this looks delicious.. great recipe! love the flavour combination and anything that says “caramelised” you know is going to taste great! thanks for the awesome post and recipe. Ohhh this looks so good!! I haven’t had spaghetti in forever!! And now that I’ve introduced gluten back into my diet, I’ll have to give it a try again YUM! Wow Amy! I love the colours on this dish! It’s absolutely gorgeous! I could live off veggies and pasta alone. This spaghetti looks amazing. I absolutely love the addition of fennel. Pinned. I haven’t ever cooked fennel, but i loooooove a good pasta and tomato dish!! This looks fantastic! Who would have imagined one could use it in pasta.